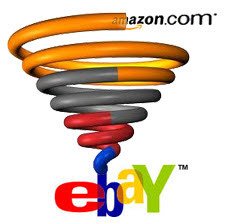 eBay Throttles Sales to Deter Amazon Arbitrage? eBay reportedly admitted to throttling sales of certain sellers beginning in April, according to a company in Israel. SaleFreaks, which provides software to help eBay sellers source goods from other marketplaces, claims eBay deliberately set out to throttle sales of certain types of companies in Best Match search, which resulted in a decline in sales for those sellers, though it isn't clear how SaleFreaks made that determination. SaleFreaks claims that after being unsuccessful in talks with eBay about problems its clients were having, it joined with large clients to initiate a legal case against eBay and met with the company before an Israeli judge on May 10th. In a post on Facebook, SaleFreaks CEO Adi Reiss wrote, "EBay admitted that they indeed manipulated the "best match" search results against "dropshippers" relative to sellers not "dropshipping" from online sites in order to "preserve eBay's integrity" and "protect purchasers." It also wrote, "Ebay's lawyer focused their argument on "dropshipping" practices that are problematic such as, manipulations of seller metrics in their favour such as falsely using the "cancellation at the buyer's request" option and "frustrated buyers" who bought items at too high a price. He also called dropshippers "crooks"." We reached out to eBay on Friday to ask about the allegations. It has not responded. If you aren't familiar with SaleFreaks, you might wonder why eBay would penalize "drop shippers," but its sellers aren't using the traditional drop-ship model. The company caters to sellers who copy listings from sites like Amazon and post them to eBay at higher prices - on the SaleFreaks home page, it calls its service an "all-in-one retail online Amazon to eBay arbitrage tool." In the US, eBay has given its blessing to drop-shipping practices. But it describes the *traditional* drop shipping method, not *arbitrage* drop shipping: "Drop shipping is typically used by sellers who buy stock in bulk from their supplier. After the seller receives an eBay order, they work with the supplier to have the item sent directly to the buyer," eBay writes. In 2012, EcommerceBytes reported on the practice of Amazon eBay arbitrage. We purchased a sampling of items from one seller to learn more about the arbitrage model; we found the prices of the items we ordered were between 15% and 37% higher on eBay than on Amazon.com, which included free 2-day shipping to the eBay buyer. Another appeal to arbitrage sellers: little risk and virtually no upfront costs since they don't procure inventory, nor must they store inventory or ship orders themselves. Since then, the process has become far more easy thanks to automated software. Paul J Lipsky, who runs webinars about "eBay drop shipping," published a video where he explains the concept and walks viewers through the process with live examples from a software program he uses. Regular sellers may be astounded as he demonstrates how easy it is to copy an entire Amazon product offer to eBay - including title, description, images, and product attributes - directly into his eBay Store. And when the item sells, he has the software automatically order it from Amazon, providing Amazon with the eBay buyer's shipping address. In November, a seller who lists unique items on both Amazon and eBay complained about the practice of sellers who use eBay drop-shipping software to copy his items from Amazon and mark them up at higher prices on eBay without his permission. "Ebay support tells me it is an acceptable ecommerce selling method. Ebay won't remove the listings even though they clearly violate the listing policy using images and text without consent. Vero program is not removing them." He said the practice makes him appear as though he is "scamming my own customers," and notes that eBay buyers who receive such an order via Amazon will receive a packing slip showing the lower Amazon price. eBay drop shipping aside, the idea of eBay "throttling" the sales of some sellers sounds egregious. However, many marketplaces and search engine companies employ algorithms that use various factors to determine the default sort order of search results. In its User Agreement under "Listing Conditions," eBay states that the appearance or placement of listings in search and browse results will depend on a variety of factors. Included in its list of criteria: "seller's history, including listing practices, Detailed Seller Ratings, eBay policy compliance, Feedback, and defect rate." eBay doesn't even have to show your listing at all, according to the following provision in its User Agreement: "To drive a positive user experience, a listing may not appear in some search and browse results regardless of the sort order chosen by the buyer." There's plenty to digest in this post, including the issue of eBay search throttling; the practice of "Amazon to eBay arbitrage"; the practice of wholesale copying other sellers' listings; and of course the quality of the buyer experience. And some sellers may wonder if they were inadvertently caught in the net of eBay's alleged crackdown. The battle of wits between marketplaces, sellers, and those seeking to exploit systems for easy gain is likely to increase, especially as artificial intelligence, machine learning, and behavioral targeting technologies become more accessible. If this is true eBay would be opening themselves to a major lawsuit by Paypal. Paypal has given out loans called "Working Capital" loans. The loans are set with a fee based on time & % paid back from each eBay transaction. When a sellers sales drop the loan takes longer to repay. I myself have never believed in throttling but I wouldn't put it past eBay to do such a thing. . .
PS: Here's a short story a friend gave me. He bought 3 new 500ml beakers on eBay. 1 came in used condition and they came in an Amazon box. He complained to the seller and the seller had another one shipped to him. It arrived in used condition, again in an Amazon box. I believe that Amazon order pickers know when an item is bought on eBay and fulfilled thru Amazon and they pick JUNK on purpose to make eBay look bad. My last eBay purchase came in an Amazon box, I figure my seller was selling on both sites and letting Amazon fill all the orders. It's a win win for Amazon and a win or lose for eBay depending on the product sent! While I don't know why anyone would want to use a drop ship model, I applaud these law suits as they expose eBay's shady throttling practices. Ethically and morally, user agreement or not, how can a company take a seller's money for an ecommerce platform service and not give them exposure? Oh wait, we are talking about eBay aren't we. They have proven time and time again that they lie and that they will throw a paying seller under the bus in a heart beat. 3) eBay doesnt know anything about ecommerce anyway - who would listen to them to start with? 4) He also called dropshippers "crooks" - well now thats REALLY the pot calling the kettle "black". eBay, who steals 24/7/365 is complaning about OTHERS doing it? BS! 5) People pay Amazon storage fees - that makes Amazon a warehouse - so "technically" its not dropshipping .. dopes. Bottom line "eBay doesn't even have to show your listing at all, according to the following provision in its User Agreement: "To drive a positive user experience, a listing may not appear in some search and browse results regardless of the sort order chosen by the buyer." IS FRAUD ON EBAYS PART. Wow, so much info to digest and try to understand how it all affects the honest independent businessperson's ability to compete for market share and visibility. No wonder we are hearing more outraged buyer complaints about buying on eBay then arriving in an Amazon box. Not to mention the furor over finding the item was cheaper on Amazon to begin with. How does this in any way contribute positively to eBay's reputation with sellers and with buyers? Perhaps eBay needs to revert back, way back, to its years ago policy requiring the seller to have physical possession / ownership of the listed item. Are we heading for one ginormous online generic clearing house that shows every item for sale on the internet, chooses your item for you and collects your payment? Think of the fun of never knowing from where and when your item will arrive. In my listings I'll have to start saying. Sold and shipped by an eBay seller, it WON'T come in an Amazon box! If Amazon is losing money (or making a very small profit) on their Marketplace, they should definitely be curtailing the amount of items that are shipped for free through Prime just for the purpose of making eBay money. And it seems they are doing exactly that. In my opinion, I believe Amazon has finally realized that it is not a sound business practice to allow arbitragers to ship many ''gifts'' to eBay buyers. They finally are identifying the dropship artists and taking action. There are a great deal of items listed on eBay which are essentially duplicate listings, just not always offered by the same sellers. When searching, it is easy to see- there often times are many like items, listed in a row, all with the same stock photos and item title. Only difference is a slight variation in price due to the margins each dropshipper wishes to achieve. If, say, even 25% of the items offered on eBay are arbitraged from Prime members, and then Amazon can identify and put a stop to half of these listings, it will not bode well for eBay. It is about time they figured this out. Why should they continue to allow their biggest competitor to profit at their expense?? Another problem with these types of sales is the frequent out-of-stock conditions which occur when a supplier has no more inventory, and the arbitrager is not made aware of this until a sale has occurred. Then they cannot fill the order for the price they have listed on eBay and still make a profit. There are punishments on eBay for seller misdoings. The most strict penalty is for non-fulfillment of an order. And it should be- buyers will not continue to shop on a site if they continually have orders cancelled. I would expect that anyone who cannot deliver an item for the price listed would be subject to a reprimand of some sort. According to eBay rules, this means the seller who did not take care of their business is then throttled or limited. As long as this is applied consistently, this is fair. But it seems that, of course, Asian or large vendors are favored. And with eBay's algorithms, a dropshipper who has, say, 50,000 items listed is treated the same as a seller who has a legitimate warehouse with goods which are in hand and ready to ship. Do not think SaleFreaks frankly has a legal leg to stand on here with eBay. Why don't they just start their own website and offer the same merchandise which is marked up? WHY?? Because there is little to no profit to make here. One thing for sure: If and when the US government requires the marketplaces to remit sales taxes to the proper authorities, this will put many dropshippers out of business. They cannot charge a tax and then pocket the money, which is another profit tactic these people employ. The party is over for those who make money while carrying no product. The eBay attorney who calls them ''crooks'' may be a bit harsh, but, in all reality, this is not a sustainable business model. @eXtinctBay, if a seller sells on both eBay & Amazon it would only make business sense to have Amazon ship all of your orders be it if it's sold on Amazon or eBay. If the seller is paying Amazon to warehouse the item why keep some at home that you have to pay for shipping when you can use FBA and pay NO shipping. eBay used to require that dropshippers identify that in their description. I wonder if that's still the case? Really people. Do you really think that ebay cares. Its the bottom line and only the botton line that counts. Ebay will do anything for the bottom line. Catching Ebay doing a wrong and proving it in court are two entirely different things. Ebay is like the fat cats in the big business world. They have the lawyers, the time and the money to fight any perceived lawsuits and will do so. In their little minds if one doesn't like the way they do business then one should leave before they force you to leave. No. And why would they ever do that? Amazon is one click away. This (dropshipper issue) also reminds me of the story of the Amazon seller who manufactured his own item for sale, and suddenly had a disproportional amount of orders coming in. He identified the person on eBay who copied his listing and sold many of his items at a profit. Then he raised his Amazon price from $49.95 to $200. The dropshipper then pleaded with him to drop his price back down, or he would be out of business, since he could no longer fulfill the orders. The answer?? One big middle finger. HILARIOUS!! I understand what they were reacting to when they did this, but there are better ways of dealing with their perceived grievances with those particular sellers. It's their site, they can and will do what they want, but every time they do something like this and it becomes public, it only makes their "platform" worse. They are slowly killing themselves. All the tech innovations in the world can save them because they are morons and the customers are not coming back. Their solutions are ALWAYS far worse than the problems, and they often were not even problems to begin with. This article is about ''sellers'' who use eBay strictly to sell the items of others on Amazon and use their Prime account to do so. No where does it mention that these folks sell on both sites, in fact they carry NO INVENTORY WHATSOEVER. You have this confused with the many, many sellers who list the same items on AMZ & eBay (AND have the merchandise in their possession). I'm talking about sellers who sell on both sites and have NO inventory! They send all of their inventory to Amazon, and use Amazon to fulfill both eBay & Amazon orders! Smart business move from what I can see if you're selling new merchandise. pace306, user agreements for many sites, especially eBay, are like pacts with the devil. At some point someone with deep pockets and an Avenatti style attorney are going to take them down. Shining a light on these user agreements and having the news report on them 24-7 is all that it would take. It's like shining a bright light on a bed of cockroaches. They will retreat. In general, most people like fairness. Therefore, it would be a public relations nightmare if the verbiage in these user agreements reached the light of day with the general public. Moreover, most of the public is unaware of eBay's throttling. People root for the under dog, and don't like it when Goliath bullies little David. Rex - you are probably %100 on how people feel. Im just not sure why it matters (to eBay buyers). Does it matter if you buy an iPhone 8 and the box says Verizon Store, D&H Distributing, or Amazon? I can only speak for myself - as long as I get the item I wanted at the price I wanted to pay for it - who cares where it comes from? If "you" (whom ever that may be) is smart enough to be able to run a business where you carry no inventory and can still make money - more power to you - and ISNT THAT WHAT EBAY DOES EACH AND EVERY DAY? Some people HATE Amazon - and I understand it well. Some of the dirty rotten tricks they play are as bad or worse then eBay - they are HARDLY saints. But as a 3p seller - you dont make sales on Amazon, you FULFILL. If you are paying short or long term storage, pick pack fees, and Amazons VIG - you arent "getting it for free". Amazon knows that people use PRIME to play this game -and if they want to stop it - they can limit how much you can ship where - but it doesnt seem to bother them all that much. They want to move boxes - unlike eBay - so to them .. a box moving is a box moving. On eBays part - its more bruised ego then anything else. Hey - if eBays all upset - let THEM pay for warehouses and trucks and personnel! I was upset that eBay ONCE AGAIN gets a pass at the known comments about intentional throttling of sellers and NO ONE BLINKS. What if they were throttling OTHER groups - Jews, Muslim, Gays, Women, people from Texas, Wyoming, Maine? The French, Eskimos? How does anyone know WHAT ELSE/WHO ELSE eBay is hurting with their hidden games? Maybe Ebay should go back to basics. Are they throttling the non-drop shippers, the 3rd party sellers like me? Who buy arbitrage / or source from stores and resell? What I mean by going back to basics: Only deal with 3rd party sellers who are non-drop shippers. Like Poshmark and Tradesy do. These sites also do NOT let the Chinese sellers in -- at least not yet. If you have inventory which is sent to Amazon FBA, then you have merchandise which you have procured for resale. This story is, again, about those who DO NOT purchase or own ANY MERCHANDISE, and all the work is done by others!! VeRO works quite well, we have drop shippers listing our branded items from Amazon to eBay and in the last two weeks 9 listings have been taken down. Good move for eBay on this one!